the free sliding of the building’s levels derives from the geometry of the dynamic surrounding landscape as if they are floating in their beautiful natural context. 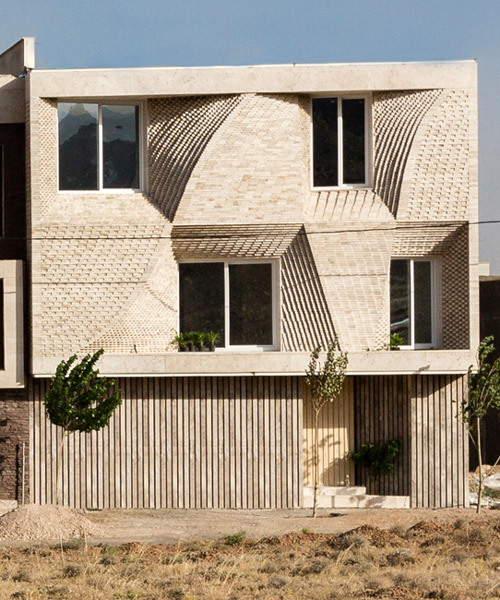 the project is located on a residential periphery of mahallat, iran, 262 kilometers southwest of tehran with the hot and dry climate. soil, clay, and cement create a feeling of warmth and consistency throughout the two monolithic volumes, complemented by natural stone flooring. 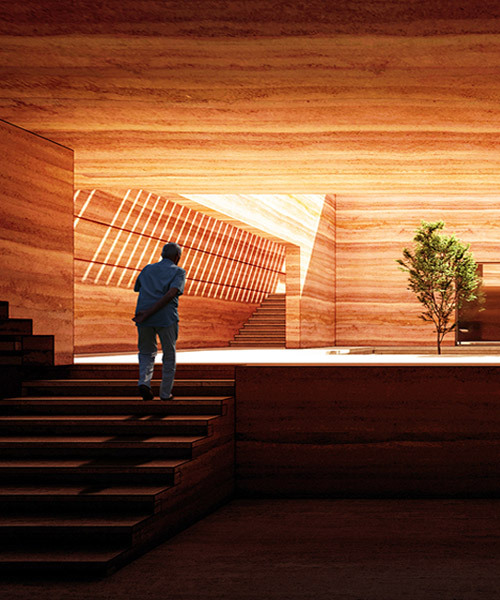 the house recalls the historical and memorable colors of local architecture. chabahar, iran, is the most important area in the oman sea coast having outstanding commercial and touristic potentials. 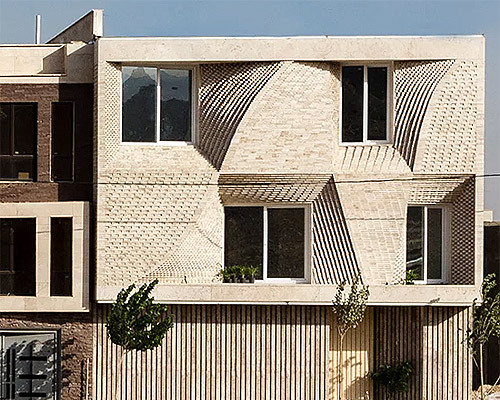 the complex project comprises several buildings made of bricks with smooth surfaces. the zoomorphic form with lunar skyline of habibeh madjdabadi's 'lunar complex' has to do with the morphology of the land and with the vernacular architecture of the hot and arid zones of central iran. 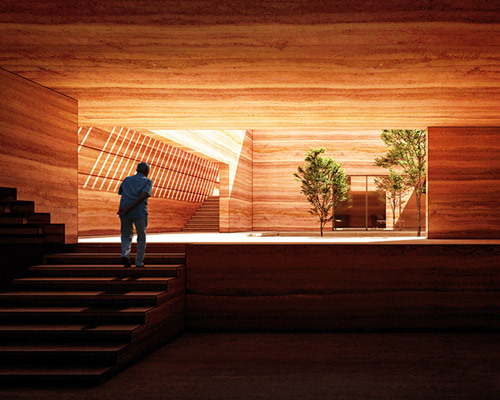 the form of omid azeri + jafar lotfolahi's newly designed residence is a transformative result of the three existing topography curves on site. hormuz island has a history of consecutive failures when it comes to environmental issues. 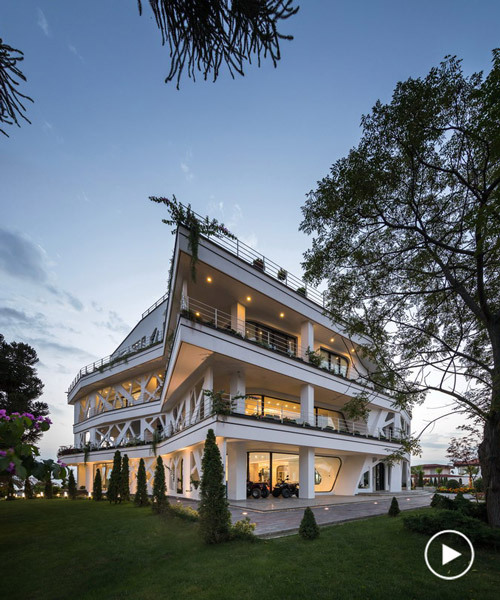 SHABOFFICE's latest residential project '[GOL]KHANEH' is a vacation home for a family of six, located about 60 km west of tehran. a white façade was the manifestation of a protest against the current situation -- an act of purification that sought to have an impact beyond the physical boundaries of the building. the dwelling allows its residents to remain in close proximity with nature in a private space conducive to hosting social and familial gatherings. controllable vents at the climax of the roof have a siphoning effect together with the large openings to the south of the building. BMDesign believes that a concave roof will help make even the smallest quantities of rain to flow off the roof and eventually coalesce into bigger drops just right for harvesting. in order to emphasize the value of collaborations, APARAT's two story interior space was designed with the idea of building a box within a building. rah shahr’s urban landmark reflects the natural form of pearl-holding mussel floating along the sea’s ripples. through a deep research into historic sources, the designer attempts to recollect the lost puzzle pieces of isfahan’s urban engineering during the safavid era of persia. called 'the house of bathe', the architect also refers to the project as 'the genetic mutation house', referring to the slow transformation of the building's recognisable façade into its shrunken rear volume. the form is chosen in order to manifest the reverse process of revitalization of some residential areas and neighborhoods. the tower provides space for two independent business units on each floor, and features a large metal façade addition that depicts various designs. located on the northern side of tehran, near the domains of the alborz mountains, the program aims to create a place where sightseeing, both to the peaks and the flat plains, is one of the principal elements. van alen institute has launched an online auction of art and design experiences, offering the chance for bidders to take part in 25 unique activities around the world. conceived in the context of tehran, iran, the cylindrical form adds to the list of high-rise developments transforming the area from orchards to urban. at the entrance, a statue-like staircase separates the private and public spaces of the ground floor, linking the overall geometry of the house.